If you are already spending sleepless nights wondering what you should gift during your next tradeshow, feel free to read this blog on indulging 7.25 x 5 magnets for tradeshow. It highlights some of the most popular items that can be built over these large rectangle magnets for influence building during the next tradeshow. By investing in calendar magnets 7.25x 5, you are going to take a positive step forward towards advertising. Stay assured that your recipient, his family, friends and everyone who stop by his refrigerator door is going to read or refer to your calendar magnet. This is perhaps the only promotional gift, which enjoys 8760 hours of non-stop exposure in the home. Gifting away customized sports schedule magnets is perfect for ticking pulse of the vast customer segment, which was relatively unknown to you. A sport is always the best remedy for minimizing gaps between different segments of the society. People forget their differences, when it comes to their favorite sport, they would be happier to receive a piece of information, which keeps them connected. Most online eCommerce stores stocking made in USA sports schedule magnets would offer you choice to select from sports magnets dedicated to different sports. You can employ 7.25 x 5 magnets for building sports schedules of your favorite sport. These full color sports schedule magnets are also perfect for raising sports spirit in the onlooker who sees them. Customized sales flyer magnets are great for building impressions on the crowd. Sales flyers were always popular and people always use them as a business reference. However, the main drawback with paper sales flyer is their low value creation over cheap paper material. Magnetic sales flyers are appealing and attractive and most people end up retaining them over their refrigerator doors forever. You can gift inspiring and indulging sales flyer magnets built over 5x 7.25 magnets to address your customers during the next tradeshow or available opportunity. These custom magnets largely remain affordable for advertisers of all budget sizes, niches, and business interests. Save the date – is a popular term for sending pre-invitations. Sales the date sales invitation built over personalized7x5.25 magnets would easily buy attention with their largeness and never-to-miss attitude. You can send invitations for your corporate events by sending save the date sales invitation. People would love them and make it a point to attend the event without fail. Wishing people for the oncoming great occasion is perfect way to tickle their consciousness. If you are attending a tradeshow, organized couple of months prior to the New Year or any other special occasion, never forget to hand out customized holiday wishes magnets. People would appreciate your efforts to make them feel at ease and special from others. Perhaps this is one of the most purposeful promotional items along with calendar magnets, which would expose you to easy crowd of leads. Personalized 7.25 x 5 magnets are perfect for crafting art posters or business posters. People would retain influential and full color magnets over their refrigerator doors for a long time. They would admire and adore it the each day or each time they go near the refrigerator door. 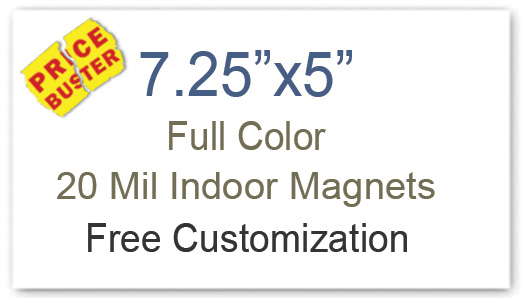 This means you can enjoy long innings in homes of your customers by handing them full color custom 7.25 x 5 magnets. You cannot expect it to screech at the top of voice announcing your brand or business, but it will definitely bring you some quality customers from close quarters. Harness benefits of full color printing to make most appropriate marketing item out of these customized magnets 7.25 x 5.